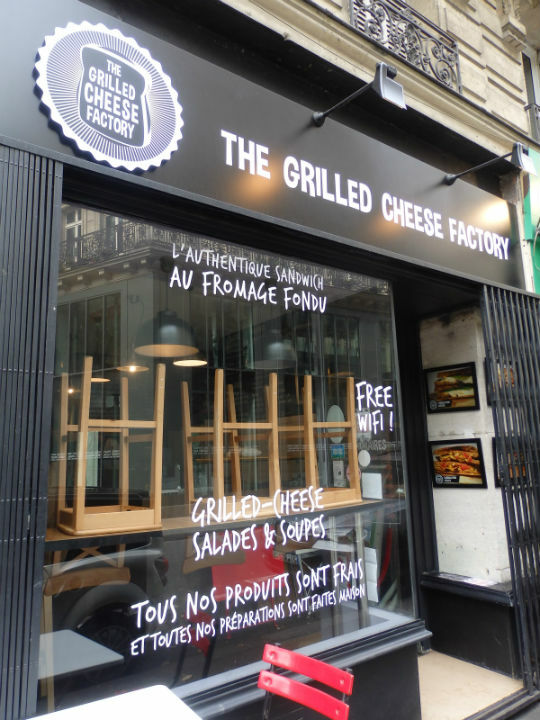 With the discovery of The Grilled Cheese Factory near Place de la Bastille, I now have the answer to the question: where do I find a grilled cheese sandwich in Paris? Opened only this year, I decided to try it out one Sunday afternoon. Upon entering the rather small establishment, one of the friendly young men asked me if I was familiar with the concept (umm…of course!) of this sandwich, which he then went on to describe as the American equivalent of the croque-monsieur. While I find the two extremely different, I went along with his comparison and he continued to tell me how he, along with two other friends, decided to create this eatery after encountering this sandwich just about everywhere during their travels in America. 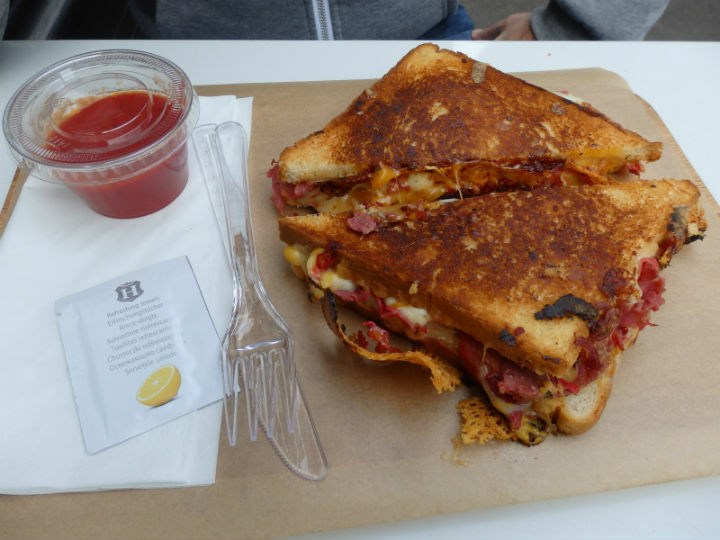 With the huge amount of hamburger, hot-dog and American-style diners popping up all over Paris and becoming super popular, someone was bound to eventually introduce the grilled cheese sandwich to Parisians. 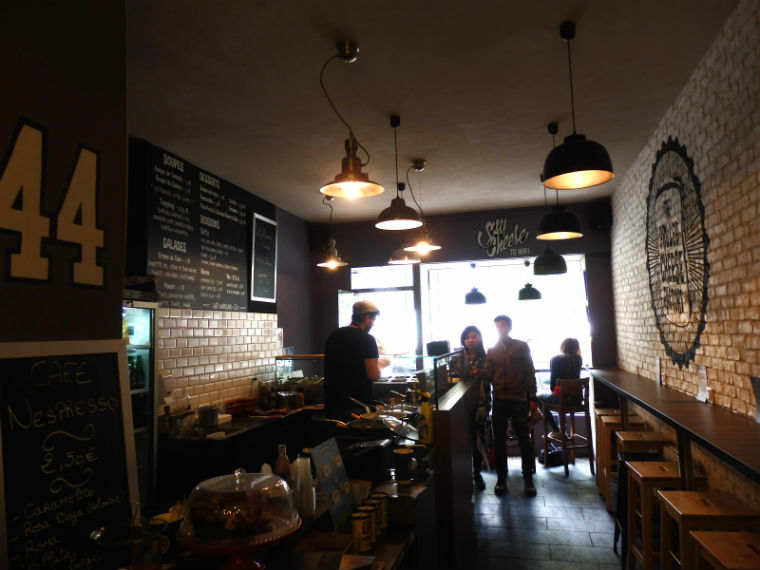 I have to say that these guys have done their research, as aside from the food, the interior also has a distinct laid-back American deli feel to it with white brick walls, industrial lamps and bar stool seating all along the counters. First thing you should know is that these sandwiches are not the basic kind you used to get as a kid (or definitely not what I remember), with a Kraft single melted between two pieces of white bread. Here the “Authentic” grilled cheese sandwich comes with 2 cheeses: Mozzarella and Cheddar (for 7 Euros)! Then there are the many variations including, “Chicken” with 2 cheeses, slices of roast chicken, honey mustard sauce and balsamic vinegar (12 Euros), “Mac and Cheese” with, yes, macaroni and cheese along with 2 cheeses and caramelized onions (10 Euros), and “Veggie” with mozzarella, peppers, tomato confit, and pesto (10 Euros), all of them completed with two thick slices of white or whole wheat bread and accompanied by their home made sweet tomato sauce. My favorite, and as usual the most expensive (sigh), was the “Pastrami”, with 3 cheeses, pastrami, pickles, and honey mustard sauce (13 Euros). While it was expensive, it was incredibly satisfying (oh the cheesy goodness!!!!) as my first meal of the day after an evening of heavy drinking the night before. These sandwiches are heavy, so don’t go here if you’re looking for a light snack! To complete their menu they also have soups (like good old tomato), salads, drinks and desserts. Obviously, for a grilled cheese sandwich, I found them to be very overpriced, but in Paris this is quite normal when it comes to trendy American-style food restaurants. 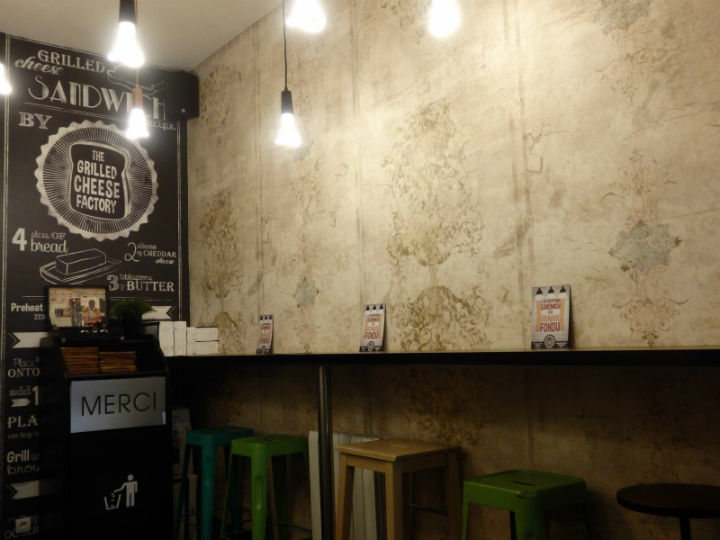 I won’t be coming here often, but if you have a desperate craving for a grilled cheese sandwich while in Paris it’s comforting to know where to find one. Until then, I’ll stick to my croque-madame…as let’s face it: everything is better with a fried egg on top! 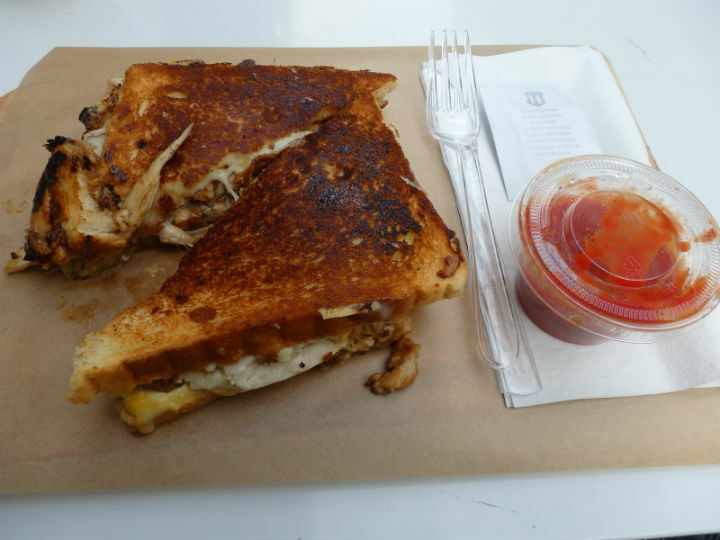 Categories: Uncategorized | Tags: grilled cheese sandwich, Paris | Permalink.